The majority of the world’s population speaks more than one language. At the same time, individuals arrive at their knowledge of a second language via very different trajectories. Moreover, an individual’s mastery of a second language results from the interplay of numerous variables that are involved in the learning process. This variability often constitutes a problem for traditional research on bilingualism and second language acquisition with human participants. This thesis demonstrates how the method of cognitive computational modeling can be used to eliminate unwanted sources of variation and facilitate a focus on the phenomena of interest. The computational model employed here simulates the process of bottom-up statistical learning of linguistic argument structure constructions from bilingual input. After gaining constructional knowledge from the input, the model is tested on carefully designed linguistic tasks. This general approach is adopted here to study the role of variables such as distributional and statistical input properties, the amount of linguistic input, the time of second language onset, and cross-linguistic influence. The reported studies are carried out within the usage-based framework, which is widely adopted in cognitive linguistics. 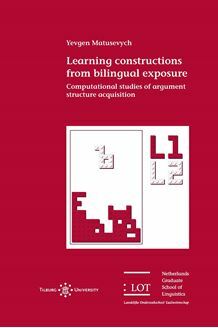 The work contributes to our understanding of the role that statistical learning plays as a mechanism in bilingual and second language acquisition, and the extent to which this mechanism accounts for various forms of linguistic behavior commonly observed in human participants. In addition, two novel multilingual corpora of argument structure usage are presented, collected for providing input data to the computational model.